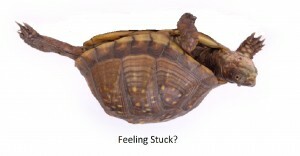 “Push harder – it’s feeling stuck” said Tim. I sensed my husband’s frustration – in fact I was also getting hot and bothered. A few weeks earlier, we’d purchased a new sofa for our first home. When the delivery guys arrived, they insisted that the sofa would not get up the stairs of our flat. Ten minutes later, they hoisted it up through a window…but in the wrong room. Here we were, attempting to move the sofa ourselves. We got it through the first doorway, shuffled it round the hallway and then…mmm… it was feeling stuck…we shoved and pushed…we heaved and tugged but the sofa would just not get through that doorway. After getting thoroughly hot, sweaty and frustrated Tim suggested we stopped and, in typical English style, had a cup of tea, dunking our biscuits and gradually calmed down. Once we were refreshed, we had another go. One small nudge and hey presto the sofa easily moved into the room. How did that happen? We couldn’t believe it! I shared this story to a client who was feeling stuck in areas of her life. The coaching session gave her breathing space allowing her to have insights. We explored what was happening to her….it wasn’t about past events – it was how she was thinking about the issues – in fact, it was that she was thinking. And her thinking affected how she was feeling. “I was feeling stuck and that something was holding me back making progress on a new project I was working on, but didn’t know what it was or what to do about it. I was becoming pretty negative about the project and just didn’t think it would work and as a result, my confidence was waning. I took the plunge, called Lindsey and arranged a date to meet. I told her I thought I would need a few sessions – she said Ok, however, let’s see how you are after one session. Lindsey Reed is an experienced international coach and trainer who enables people to get unstuck, transform their lives and be their best selves. If you would like to work with Lindsey, contact her either by email lindsey@glows-coaching.co.uk or call 01832 280168 for a chat to see if she is the right coach for you.